This week’s readings on ecologies was a bit overwhelming. Guattari’s argument is an advancement of Bateson’s Steps to an Ecology of Mind. I was delighted to find that Guattari’s The Three Ecologies was much shorter than I thought. However, this delight shifted to sadness upon realizing that Guattari’s work centered on the deterioration of human life and society. He states that the “techno-scientific transformation” has led to “ecological disequilibrium.” Guattari points out social and political issues, oppositions between East-West, and tensions between men and women. He argues for ecosophy (ecology and philosophy). 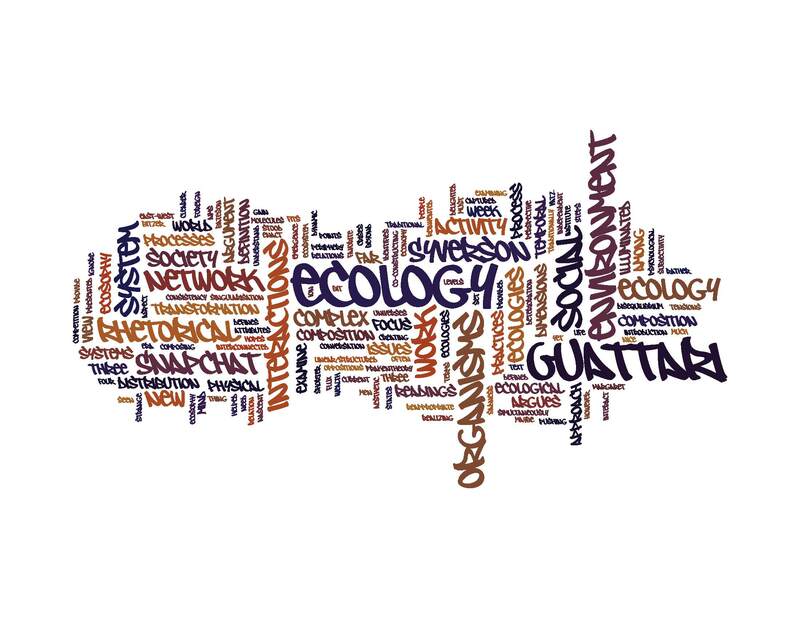 Ecosophy would examine and complex interactions between the three ecologies of mind, society, and the environment. The three ecologies are interconnected. So, there is not one approach to tackle world issues. The ecosophy aims to provide a new way of examining the world in hopes of creating a balanced society and protected environment. .
“Rather than remaining subject, in periphery, to the seductive efficiency of economy competition, we must reappropriate Universes of value, so that processes of singularisation can rediscover their consistency. We need new social and aesthetic practices, new practices of the Self in relation to the other, to the foreign, the strange – a whole programme that seems far removed from current concerns. And yet, ultimately, we will only escape from the major crises of our era through the articulation of a nascent subjectivity, a constantly mutating socius, [and] an environment in the process of being reinvented” (45). Guattari’s work was illuminated by the definition of ecology provided by the Cary Institute of Ecosystem Studies. Ecology is defined as “[t]he scientific study of the processes influencing the distribution and abundance of organisms, the interactions among organisms, and the interactions between organisms and the transformation and flux of energy and matter.” What stood out to me most about this definition, and connected to Guattari, are the focus on ecology as a process, and the focus on the interactions and relations among the organisms. This is not focused on a linear/structured view of ecology. This is a dynamic view the includes the organisms and the environment. This was a nice build up to Margaret Syverson’s “Introduction: What is an Ecology of Composition” in The Wealth of Reality: An Ecology of Composition. This is my favorite thing so far this semester. I wish I had read this earlier in the term to gain a clearer sense of applying a theory of network to an object not traditionally seen as a network. This also helped me to understand Frakentheory. Syverson defines ecology as a “set of interrelated and interdependent complex systems” (5). The ecology of complex system is “a network of independent agents—people, atoms, neurons, or molecules,” that “act and interact with each other, simultaneously reacting to and co-constructing their own environment” (3). Syverson identifies four attributes of the ecological systems: distribution, emergence, embodiment, and enact ion. What I liked most about Syverson’s work is that she aimed to push composition beyond the rhetorical triangle (writer, text, and audience). She argues, “[T]hese traditions often ignore the psychological, social, temporal or physical dimensions of writing.” This approach illuminated the limitations of the traditional conceptions of the rhetorical situation presented by Bitzer and Vatz. This examination of ecology system is pushing me to examine Snapchat from a different perspective. I have been looking at rhetorical activity and then levels of activity. Most of the conversation focuses on Snapchat as a social network rather than a messaging application. After this week’s readings, I am thinking that maybe I could return to the composition aspect of Snapchat but in terms of ecology system instead of rhetorical activity system. Snapchats role in social media also plays apart in the ecology system. This could work in regards to how Snapchat fits within the social, temporal, and physical dimensions of composing a snap. I’m thrilled you enjoyed a reading so much and, more importantly, I’m happy these readings got you to reframe a way to investigate snapchat.